"In the heaven of our soul let us be praises of glory of the Holy Trinity, praises of love of our Immaculate Mother. One day the veil will fall, we will be introduced into the eternal courts, and there we will sing in the bosom of infinite Love. And God will give us 'the new name promised to the Victor.' What will it be?" - St. Elizabeth of the Trinity, "Heaven in Faith, Retreat No. 10, from Complete Works of Elizabeth of the Trinity, Vol. 1, ICS Publications. Excerpts from his many letters can be found in several categories in this blog, especially "The Sea," as he used the sea as a common metaphor for spiritual principles. "Let us get to the essential point of your letter which concerns your soul. The obscurity that you sense is a sign, as I told you at other times, that God wishes more recollection from you in pure faith, and I would wish that you often center yourself in your interior, and with a lively faith take your repose on the bosom of God like a baby in a sacred silence of faith and holy love. Every time your soul recollects itself in God, in the inner temple of your soul, it is born anew to a new life of love in the Divine Word Jesus Christ. I pray the Lord to help you understand and practice what I am teaching. In this recollection in the flame of holy love all the remains of sin are destroyed and the soul is renewed in God." - Letter 1341 to Maria Cherubina Bresciani (46), written from San Angelo, December 15, 1761, from Volume III of the Letters of St. Paul of the Cross. For more information about the Passionists, and for many of his letters available online, see the Passionists website. 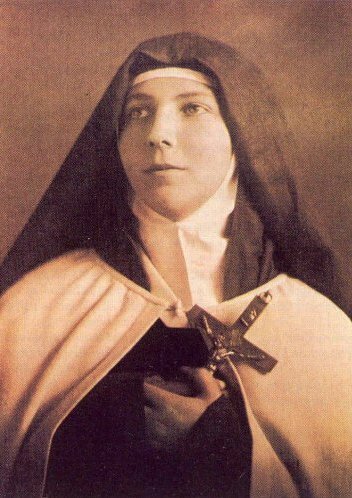 Page with downloadable .mp3 file with a reading from her diary: "God the joy of my life"
She is one of several Carmelite saints named "Teresa". The others include St. Teresa of Avila, St. Teresa Margaret of the Sacred Heart (of Florence), St. Thérèse of Lisieux, and St. Teresa Benedicta of the Cross (Edith Stein). There are also beatified Carmelite "Teresa's", including Bl. Teresa of St. Augustine, who was among the nuns of Compiègne who died in the wake of the French Revolution, Bl. Teresa of the Child Jesus St. John of the Cross, and Bl. Teresa Maria of the Cross. Both Bl. Teresa of St. Augustine and Bl. Teresa of the Child Jesus St. John of the Cross were martyrs. The man now known as "Brother Lawrence of the Resurrectin" was born as Nicholas Herman in French Loraine around 1611. He never had much formal education. When he was eighteen years old, in winter, Nicholas saw a leafless tree and began thinking about the coming spring and the tree’s spring renewal, bringing flowers and fruit. The thought gave him a view of God’s providence and power, and a great love for God, which never left him thereafter. It prompted his conversion. As a young man, Nicholas served for a while as a soldier and as footman to M. Fieubert, the treasurer. He said he was “awkward” in the job, and said he broke everything. In 1666, he became a lay brother among the Discalced Carmelites in Paris. From then on, he was known as “Brother Lawrence.” At the monastary, he worked for at least 15 years as the cook. He did not like the work. However, he believed that it was necessary to adhere to God as strictly in action as one does in prayer. He said the time of business did not differ from the time of prayer. In the noise and clatter, and with various people calling for different things at the same time, he possessed God “in as great tranquility as if I were upon my knees at the blessed sacrament.” (Conversations, fourth conversation). As cook, Brother Lawrence traveled to other parts of France at least twice to buy wine for the Monastery. He did not like the task, since he had no interest in business negotiations and because he was lame. He could only move around the boat by rolling himself over the casks. However, he told God that he was about His business, and afterward he was pleased with the results. Theological debates bored him. He complained that some people exercise their mind in reason and science, forgetting that there they can see only a copy, while they “neglect to gaze on the Incomparable Original.” Indeed, the practical simplicity of Brother Lawrence’s remarks endear people to him. He had only one message, repeated different ways, which was the importance of experiencing the presence of God, and of God’s love, in the depth of one’s soul. Formalistic spiritual exercises also held no interest for Brother Lawrence. He said that many do not make progress because they get stuck in penances and exercises, while they neglect the love of God, which is the point of all such things. (Conversations, third conversation). He saw no need for a spiritual director to help him with his life of prayer. He felt that all the guidance he needed for the inner life of loving God with all his heart was in the Gospels. In his last days, Brother Lawrence felt great pain in his side, but joy continued to be seen in his face and in his speech. 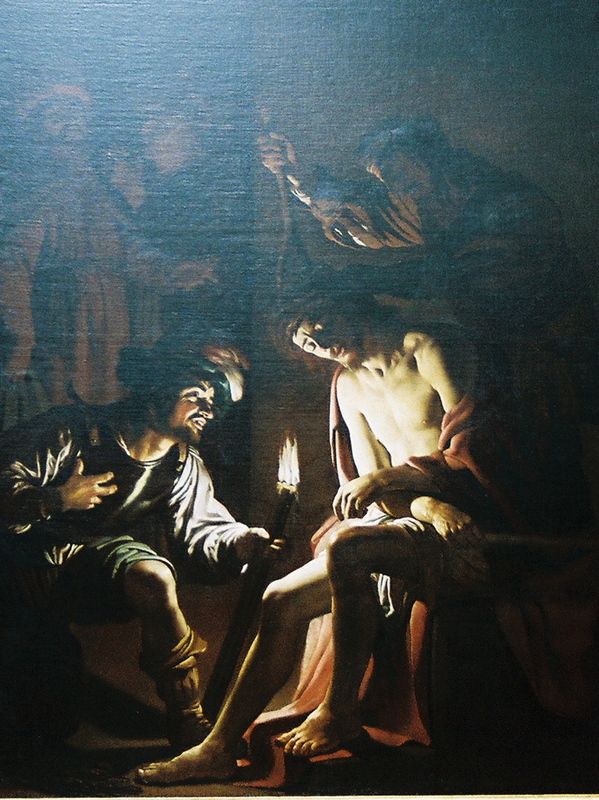 He asked the monks to turn him onto his painful side to satisfy a desire to suffer, to “bear just a little for the love of God.” He died on February 12, 1691, at the age of 80. After Brother Lawrence’s death, his letters and maxims were collected and published by a contemporary whose identity is not fully certain, but who is thought to have been M. Beaufort. The same person also wrote a summary of Brother Lawrence’s teachings, compiled under the name “Conversations,” and a short biography entitled “The Character of Brother Lawrence.” The “Character” states that it was written about two years after Brother Lawrence’s death. The conversations and letters are known together as On the Practice of the Presence of God, the best known collection of his sayings. The Maxims were originally published with the letters, but were less widely republished in later years. This short biography was written primarily from those short works. "Since God is all-powerful, his will embraces everything that happens in the world and in our lives. His will embraces everything that touches or occupies us, whether it is a threat or a task or an event. . . . Each second we live prolongs our existence. Each succeeding second is offered to us as a gift from the hand of God, our omnipotent creator. When we have understood this truth and when we live continually each day in a real state of authentic abandonment, we have at our disposal a new way of ceaselessly communing with God." - Jacques Bunel, "Hope and Abandonment", from Spiritual Life, Winter 2005, an excerpt from Listen to the Silence: A Retreat with Père Jacques, translated and edited by Francis J. Murphy, ICS Publications, 2005. "As Brother Lawrence had found such an advantage in walking in the presence of God, it was natural for him to recommend it earnestly to others; but his example was a stronger inducement than any arguments he could propose. His very countenance was edifying, such a sweet and calm devotion appearing in it as could not but affect beholders. And it was observed that in the greatest hurry of business in the kitchen he still preserved his recollection and heavenly-mindedness. He was never hasty nor loitering, but did each thing in its season, with an even, uninterrupted composure and tranquillity of spirit. "The time of business," said he, "does not with me differ from the time of prayer; and in the noise and clatter of my kitchen, while several persons are at the same time calling for different things, I possess God in as great tranquility as if I were upon my knees at the blessed sacrament."" - Brother Lawrence, The Practice of the Presence of God, translation/edition Fleming H. Revell.